If you’ve been freelancing for very long, you already understand the importance of scheduling your time effectively. Clients want more output for every dollar that they pay you. You want more profit for every braincell you utilize. Therefore, intelligent time management is key. But what about family time, fitness, weekends, and vacations? Speaking from experience, I would argue that scheduling this time is as important (if not more so) than your client time. Soon into my freelancing career, I decided that working on Sundays would need to stop. If I wanted to be both effective and efficient, giving myself time off was certainly a priority. From that day forward, I made the investment in my family to never work again on Sunday. So, if you were to send me a calendar invite for Sunday, I would politely decline the invitation and ask for a different time and date. Very few things can’t wait until Monday. Your family also needs you to set boundaries for yourself during the workweek. I have set a hard stop for myself of 5:30 pm each work day. I do my best to not break this rule, but sometimes I do fail. If I’m going to be running a little late, I try to let my wife know in advance. If you want your home to be an enjoyable workspace, it’s very important that you schedule your family time. Your spouse and children want to spend time with you, so setting predictable work patterns is advisable. In my last physical, my doctor asked about my exercise regimen. I was honest and said that it was hit-or-miss. Some days, if the weather was nice enough, I might find time to go for a brief jog. In reality, I was only exercising once or twice per week. My doctor didn’t care for this answer, and he recommended that I invest in my own health by exercising daily. Upon this advice, my brain began to spin. How would I be able to fit regular exercise into an already-packed day? Also, how would I be able to exercise if the weather is bad at least 100 days per year? The former question was a bit trickier. My weekday schedule was already packed from about 7:15 am until 5:30 pm. How would I find time for my new exercise routine? The answer was quite simple: wake up a little earlier. Instead of rolling out of bed at 7 am and starting work by 7:15, I now get up around 6:15 am and start working by 6:30. I take a break at 7:30, which gives me plenty of time to eat breakfast with the family, take a brief jog, and take a shower. I’m usually back at my desk by 8:10 – altogether about a 40 minute break. In doing so, I am enhancing my health and also getting more quality time with the family. I love going on vacations. Like many Midwesterners, our family enjoys traveling to the Florida coast each year for some fun in the sun. Not only is it a great family experience, it can also be a time to re-charge your freelancing battery. Not too bad, right? A week on the beach for less than $2,000 sounds reasonable. But, keep in mind that we freelancers get paid for what we do. “Paid time off” is only for salaried employees. Let’s assume my hourly rate is $50. Let’s also assume I will not work any hours (unlikely) while on vacation. Losing 40 hours of billable time just cost me $2,000. So, therefore, the “true cost” of my vacation is actually about $3,750. While these additional income streams are only a fraction of my billable potential, they do add up to a noticeable amount. Thus far, they seem to be viable options for making freelancer vacations more possible. 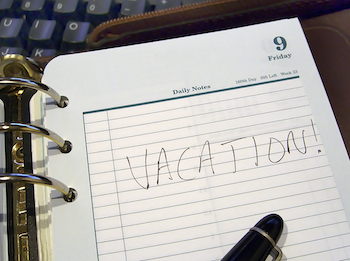 What ways can you offset the “true cost” of time off? Have a tip to share? Comment below.